These presentations are your door to the vast, rich world of historic bridges. If you are new to the world of historic bridges and are confused by any of the terms used on HistoricBridges.org and other bridge websites, these presentations are for you. If you are looking for a list of truss bridge configurations with example bridges, these presentations are for you. Finally, if you want to document historic bridges like HistoricBridges.org, or learn more about HistoricBridges.org, than this is the right place to be. Presentations are offered in Adobe PDF and Microsoft PowerPoint 2007/2010 versions. If you do not have Microsoft PowerPoint 2007 or later you can download Microsoft's free PowerPoint Viewer, a 61mb download by clicking heree. A crash course in historic bridges that includes a guide to truss bridge configurations. This is a large presentation that provides a wealth of information. It is designed to be a crash course in the vast, rich world of historic bridges. If you are new to the world of historic bridges and are confused by any of the terms used on HistoricBridges.org and other bridge websites, this presentation is for you. If you are looking for a list of truss bridges with example bridges, this presentation is for you. 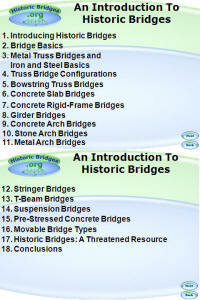 Most common historic bridge structure types are discussed and explained in this presentation, although a special focus is placed on metal truss bridges. Information about the presentation and options to download it are available directly below. The presentation comes in two formats, Microsoft PowerPoint 2007 as well as Adobe PDF. High-Quality PowerPoint Version - 103 Megabytes- This PowerPoint version has an interactive table of contents and interactive navigation buttons. This version is also provided for website visitors who wish to edit the presentation and/or give the presentation using projection equipment. Please make yourself aware of the terms and conditions for using and editing website content for presentations on the- This PowerPoint version has an interactive table of contents and interactive navigation buttons. This version is also provided for website visitors who wish to edit the presentation and/or give the presentation using projection equipment. Please make yourself aware of the terms and conditions for using and editing website content for presentations on the About page. Standard PDF Version - 41 Megabytes - This is an enhanced PDF version, which means that the interactive buttons and table of contents will function fully. This option is provided for those who simply wish to view the presentation and/or cannot or do not wish to install the Microsoft PowerPoint Viewer. 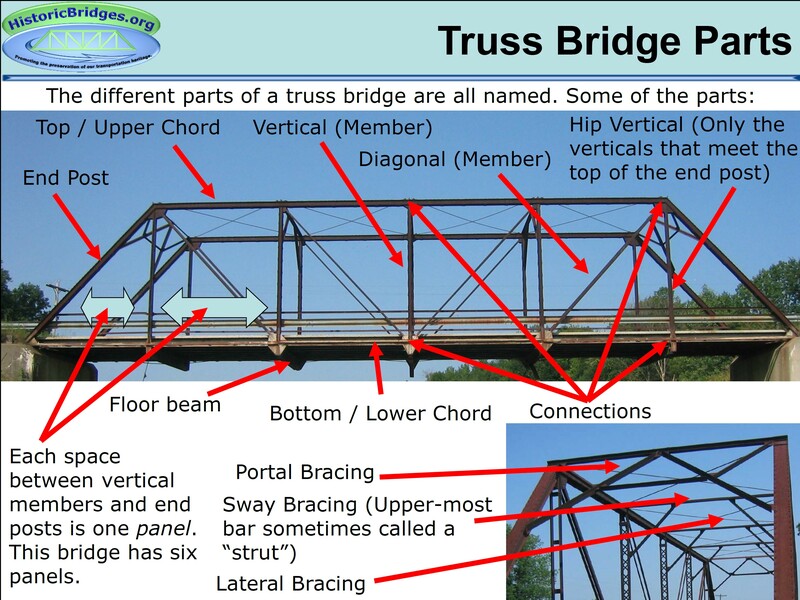 Finally, A JPG Version of the popular Truss Bridge Diagram Slide is provided below. Click to view full size. What to do when you visit a historic bridge. Iorder to truly record the history of a bridge, and also to fight for the preservation of historic bridges, it is important to do more than take a few photos of the bridge from a distance. Learn more about the bridges you visit and also gain the upper hand when dealing with highway agencies by conducting a historic bridge inspection. Also learn about some of the basic types of historic bridge preservation solutions.In order to truly record the history of a bridge, and also to fight for the preservation of historic bridges, it is important to do more than take a few photos of the bridge from a distance. Learn more about the bridges you visit and also gain the upper hand when dealing with highway agencies by conducting a historic bridge inspection. 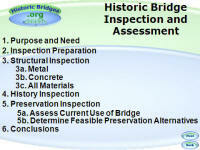 Also learn about some of the basic types of historic bridge preservation solutions. PowerPoint Version 75.3 Megabytes- This version is designed suitable both for personal viewing on a home computer or for projection onto a screen for presenting. Please make yourself aware of the terms and conditions for using and editing website content for presentations on the- This version is designed suitable both for personal viewing on a home computer or for projection onto a screen for presenting. Please make yourself aware of the terms and conditions for using and editing website content for presentations on the About page. Standard PDF Version - 12.5 Megabytes - This version is a static version, which means that the interactive buttons and table of contents will not function. This option is provided for those who cannot or do not wish to install the Microsoft PowerPoint Viewer. A look inside this website and how we work with historic bridges..
HistoricBridges.org has grown from a small personal website to one of the largest resources for historic bridges on the Internet. 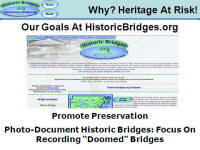 More than a website, more than a database, HistoricBridges.org works with historic bridges in many ways. Learn more here in this very short presentation. PowerPoint Version - 24 Megabytes- This version is designed suitable both for personal viewing on a home computer or for projection onto a screen for presenting. Please make yourself aware of the terms and conditions for using and editing website content for presentations on the- This version is designed suitable both for personal viewing on a home computer or for projection onto a screen for presenting. Please make yourself aware of the terms and conditions for using and editing website content for presentations on the About page. Standard PDF Version - 2.3 Megabytes - This version is a static version. This option is provided for those who cannot or do not wish to install the Microsoft PowerPoint Viewer.